We’re now living in the ember phase of Autumn. Where trees once stood tall as flaming torches, they are now skirted ’round with embers…the last of the burning…an undergrowth aglow. I love this sight: a blanket of still-fiery leaves marking the circumference of the canopy. To walk into it must feel like walking in a fairy land, or like being royalty on a jeweled carpet. It is Fall’s last blaze before it all goes gray to charcoal with only evergreen hints here and there. I know I will love that too. But I want to hold onto THIS, this ember-carpet pooled under near-bare trees. I don’t want it to go…can’t I stay? Can’t the leaves remain golden? I know the answer before I’ve even asked. And it isn’t just leaves I’m thinking of. Can’t we just stay in glowing years of health and youth? Can’t my kids stay young and at home? Can’t my husband and I remain healthy in body, teeth intact, eyesight fair? The rhythm of the seasons is both lovely and arresting, peaceful and unsettling. For as each season morphs into the next, life changes, bodies change. Once flaming stalks of youth and beauty give way to skirted embers and then on to gray lines etched into white. I’m living the roll of the seasons and at 46 I feel like I can reach one hand back and touch, feel, remember my childhood, my wedding day, my kids’ births; and at the same time I can reach forward to what I know must come. This standing in a place where the view is so expansive almost hurts. Yes, there’s beauty abounding to be sure. But seasons past are to be no more and where I’m standing, though blanketed with jeweled embers, it is fleeting. It too will morph and change and I don’t know how the gray lines will feel. All I can do is stand here, NOW, and enjoy the jewels I’m given. Your thoughts are wonderful and so true – enjoy the moment. We have summer stating here and it is so green but the heat of summer will come and everything will dry off and go that amazing yellow/grey colour and we will be able to smell the eucalyptus oils in the air. Oooh, where are you from sandy?? Summer, now? Australia? That is so cool! Thank you for visiting and commenting so faithfully! Wonderful prose. You have put my thoughts into words far better than I could. I love the whole concept of the picture and your words, but at 62 not sure I like the ending. Thank you Phil. I think I need to keep drawing through the seasons, since it helps me uncover the beauties therein. Perhaps I will need to draw even MORE as the years advance. I hope you can find beauty in the season you’re living. Thank you so much for visiting and commenting here today! Beautiful post. And wonderful drawing, as always. that’s a beautiful way to look at life! And a beautiful drawing too! beautiful sketch and post. I agree with enjoying life and it’s precious moments! The fact that change is inevitable is both wonderful and horrible at the same time. Nothing remains, but new beautiful things will come. The cycle of life and all that. Thanks for sharing your beautiful image and thoughts. Hi! great blog, beautiful painting. do you have a site where you sell your work? No, not online. I do sell my work locally, Han. You are welcome to inquire about prices, shipping, etc. But thank you for asking!! And for visiting my blog. 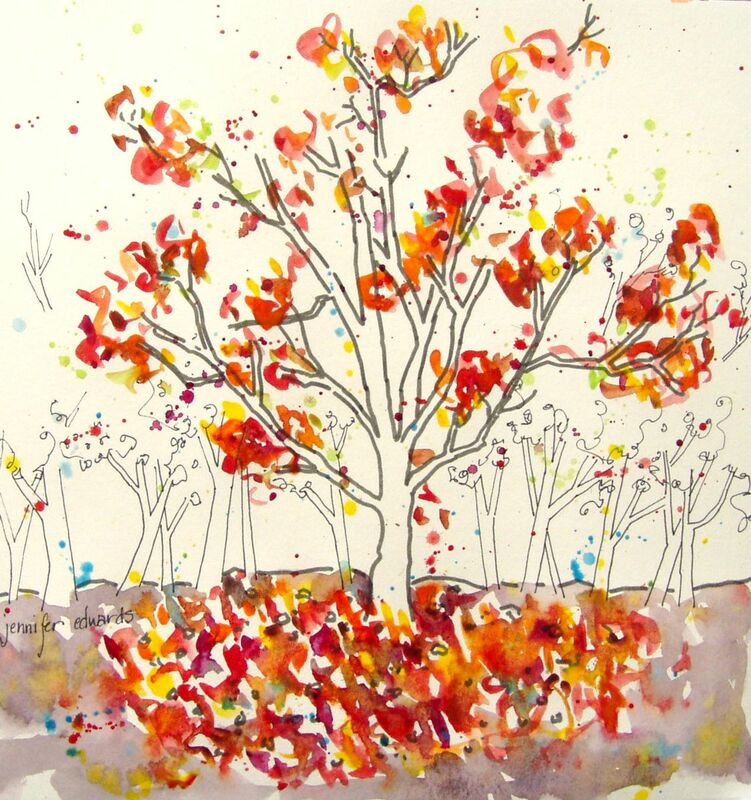 well, i love fall and i love this painting! can you tell me price and perhaps shipping? (i live in the southeast U.S.) you are welcome to post them as a comment on my blog, cinnamonhan.wordpress.com.